Am 13. 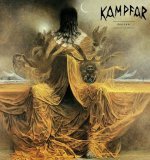 November 2015 veröffentlichen Indie Recordings das neue Kampfar Album mit dem Titel Profan als CD Jewelcase, Limited CD Digipak w/patch, Black LP Gatefold, Limited Orange LP Gatefold with Black and Yellow Speckels. Band und Label haben jetzt die Album Details enthüllt. "It only gets bleaker and colder from here. “Profan” represents no hope, a life of filth, a surrender to the laws of Death and the Scythe. ": sagte Dolk (Vocals).